Record keeping: Part 2 of a series of notes about what is planted and what is blooming currently in the garden. 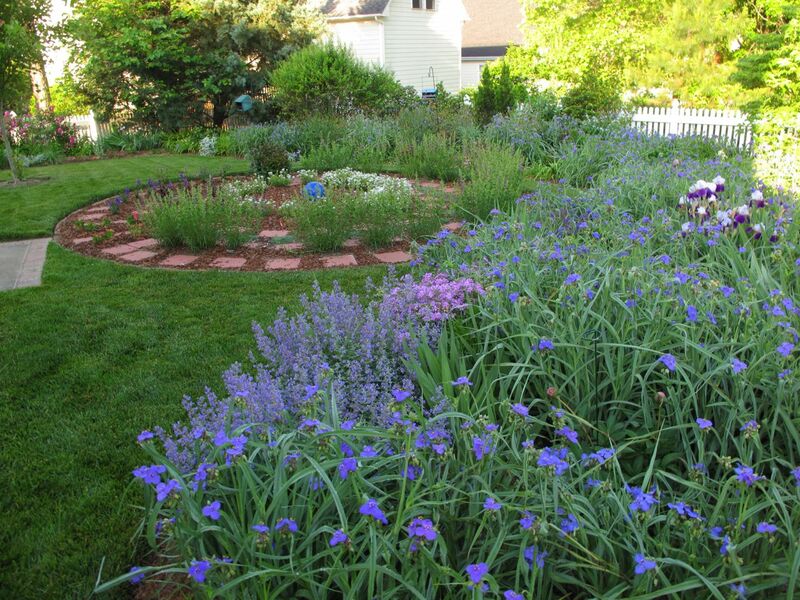 The northern border is filled with Tradescantia (Spiderwort), Nepeta (Catmint), Phlox divaricata (Woodland phlox), Bearded Iris, and an Iceberg rose. Siberian Irises at the far end of this border are yet to bloom. Daylilies have grown large. As the border transitions around to the west even more Tradescantia has crept in. Across the meditation circle toward the NW corner of the garden is a favorite native tree, Cornus florida (Flowering Dogwood). This dogwood had its best show ever this spring. A ‘Carolina Sapphire’ Arizona Cypress that used to fill this corner of the garden died last year. Its replacement is growing, but it will be a few years before it takes over to lessen the awkward, unbalanced look. 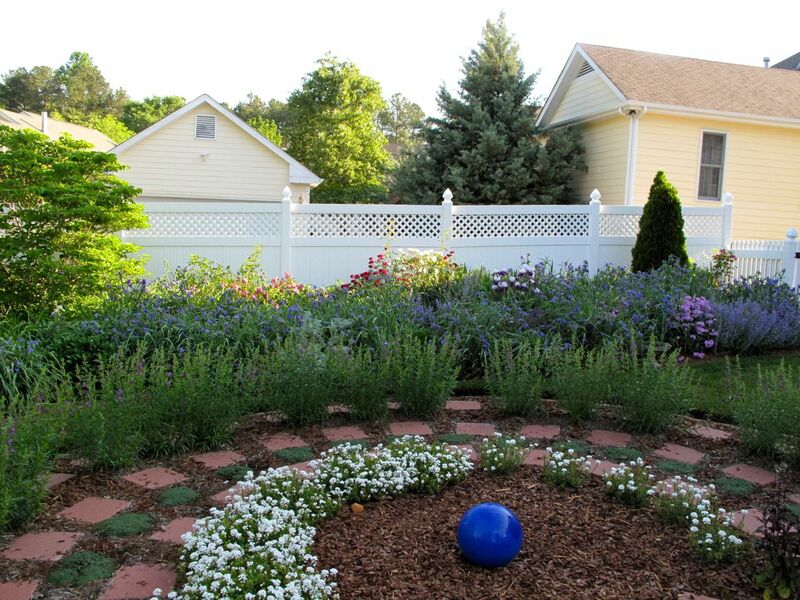 I planted gladioli and zinnias against the fence this morning so the corner should be colorful later in the summer. 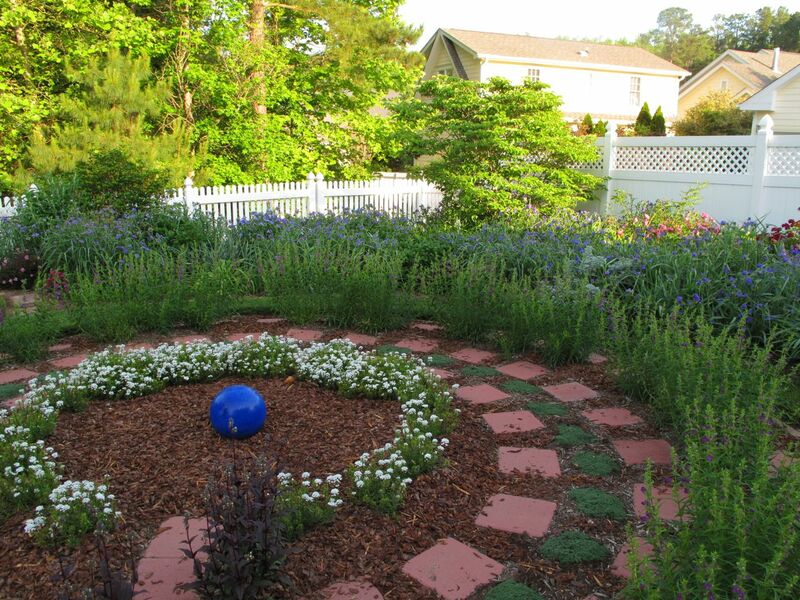 Behind the meditation circle, in the western border (above left) red Dianthus and Gaura lindheimeri ‘Passionate Blush’ (Butterfly Gaura) provide additional color. Phlox subulata were added this year to this area in early spring are nearing the end of the bloom cycle but will remain green in the front of the border. A recently added Veronica aspicata ‘Pink Goblin’ (Speedwell) is blossoming. In the western border a single Dahlia ‘Stargazer’ returns annually and I came across it this morning. It is the sole survivor of dahlias a friend started from seeds and shared with me years ago. Backing up to the fence in this section, a Buddleja davidii ‘Black Knight’ has grown tall but is not ready to bloom. 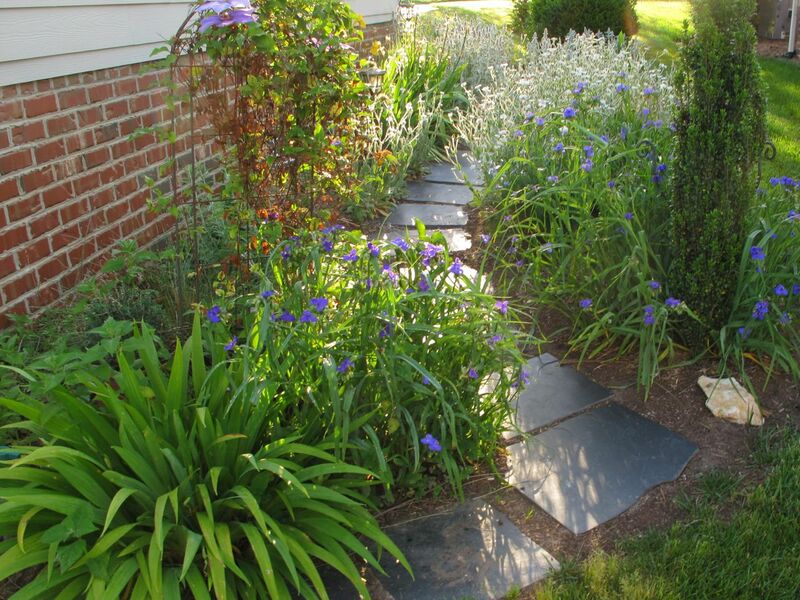 Tradescantia mixes with Aquilegia canadensis (Eastern red columbine), Verbena bonariensis (Tall Verbena), and perennial Dusty Miller. Nearby Foxglove and Rudbeckia hirta ‘Irish Eyes’ are growing slowly, while Achillea x ‘Appleblossom’ (Yarrow) is beginning to bloom. Along the fence five or so Gardenia jasminoides ‘Chuck Hayes’ evergreens prepare to flower. In the center two Italian Cypress trees planted a couple of years ago are beginning to add much needed verticality. A Spiraea shrub bloomed well earlier and needs pruning soon. Both in the western border and in the meditation circle white buds sit atop Penstemon digitalis ‘Husker Red’ (Beardtongue). 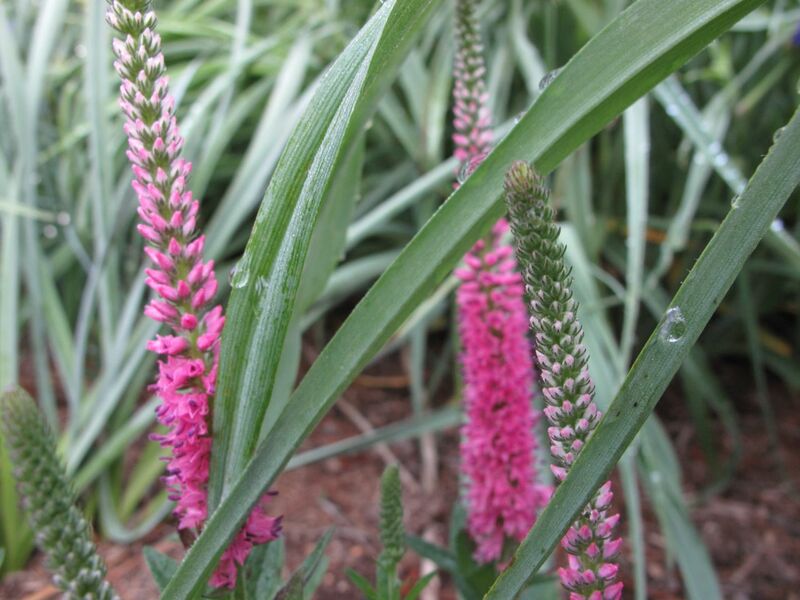 This evergreen perennial has burgundy and green leaves that contribute color as well. Clematis ‘Jackmanii’ is turning brown from fluctuating temperatures and little water. A couple of weeks ago it was 34 degrees and today it was 92. Monarda didyma (Scarlet beebalm), Perovskia atriplicifolia (Russian Sage) and Salvia guaranitica ‘Black and Blue’ are starting to grow up behind the clematis. White Lychnis coronaria (Rose Campion) just began blooming all along the path that leads up from the garden to the front of the house. In the middle section, yellow Bearded Irises are nearly finished for this year. Beyond the irises are lavender and Stachys byzantina (Lamb’s Ear). This entry was posted in garden and tagged nature photography, perennials, photographing nature, rose campion, spiderwort, tradescantia on May 4, 2012 by pbmgarden. Yes, it is hard to photograph just how soothing it feels to be in the midst of all that blue in the early a.m. Sadly the tradescantia provides much of the blue and closes in the afternoon. Eventually I hope to swap out much of it with some other plants, but don’t know what. Thanks for your comments. 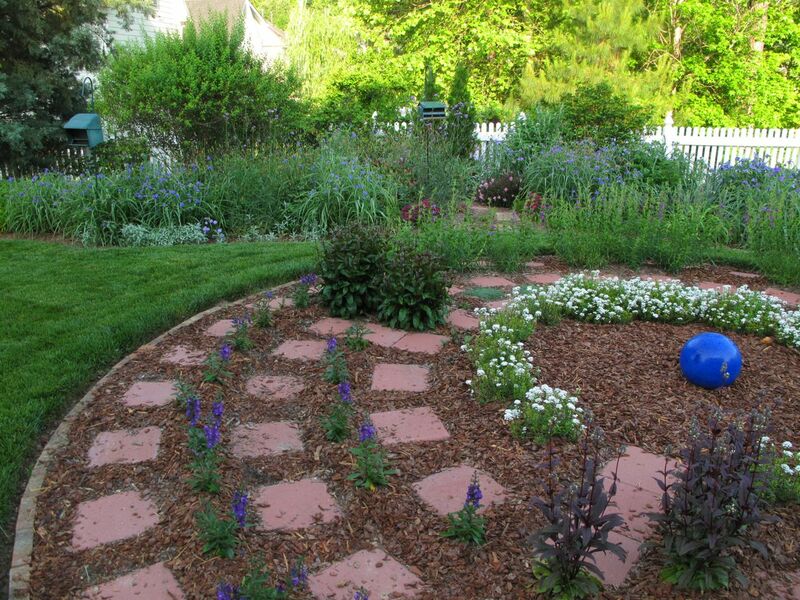 It might be nice to use more nepeta. Larkspur would be lovely but do not grow well here in the heat and humidity of NC. Today I saw a beautiful grouping of delphinium, but someone must be babying them quite a bit to make them look nice here. Thanks for your suggestions. Judy, hope you’ll enjoy your new garden. It will be beautiful!